Where it comes from: The fruit has been widely cultivated through the Mediterranean and the Middle East. History credits Spanish padres with bringing pomegranates to California more than 200 years ago. Now California’s San Joaquin Valley is the heart of the United States’ commercial crops. What it’s good for: Pomegranates are now being touted as one of the hot new “super foods” that both taste good and are good for you. High in vitamin C and potassium, pomegranate juice is a good source of fiber and it’s also low in calories. The juice is high in three different types of polyphenols (tannins, anthocyanins, and ellagic acid), a potent form of antioxidants. As antioxidants, they are credited with helping in the prevention of cancer and heart disease. The powerful antioxidants in the fruit also help retard aging and can neutralize almost twice as many free radicals as red wine and seven times as many as green tea. Where you’ll find it: Cocktails and gourmet food preparations. 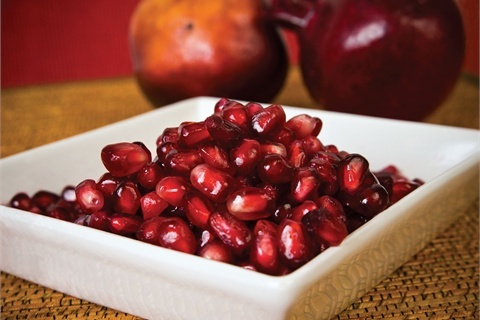 Pomegranate extract is often used in both topical and oral skin care products as well. Other uses: In addition to many medicinal purposes, pomegranate flowers are used to make a red dye. Pomegranate is used in traditional Jewish ceremonials as a symbol of fertility and prosperity. Pomegranate juice is used for the production of grenadine.